Review written by and copyright: Rick Curzon (14th January 2019). A gripping modern war thriller about a Norwegian solider who returns home from Afghanistan but cannot leave the conflict behind. How far should you go in the name of peace? Lieutenant Erling Riiser from the Special Forces returns home exhausted to his family in Norway after his tour of duty in Afghanistan. The day after he returns, Erling receives a text message from a senior officer with an apparent tip-off telling him a woman's life is in danger, and he is ordered to kill an Afghan man who has her. After rescuing the woman, he soon finds out his superior did not send the message. Erling must find out who sent the orders, and why he is being used as their hitman. Unable to trust anyone, Erling finds himself in the middle of a complex political killing game. 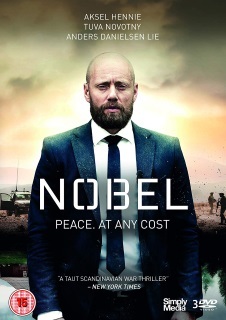 With flashbacks to the war interwoven throughout, Nobel places a dramatic conspiracy plot at the centre of the rarely-told story of Norway s involvement in Afghanistan. Simply Media are releasing this superb, highly engrossing war-thriller-drama in a 3-DVD set. This is a digitally shot production lensed in HD but being presented in standard definition by Simply. I find that all digitally shot productions have a very different feel to those lensed on film with a somewhat muted look which may be something to do with the digital colour correction applied in post production. The image here is overall rather soft and yet detail is present and at times pleasing. The cinematography has that bright, flat look that lacks appreciable depth. I suspect this is a stylistic choice that goes hand in hand with the hand-held cinema verite camerwork; to give it an immediate documentary feel. All of the scenes in Afghanistan have a bright look with lots of browns, yellows and other colours associated with sunlight and deserts. The Norwegian scenes have a colder feel, but throughout a more natural colour palette is maintained and at it's most robust in the scenes set on a Norwegian farm. Black levels are deep and rich with surprisingly little unintended crush although there is the odd moment where shadow detail is lost. Compression is generally good due to only three episodes each on the first dual-layered discs and two on the last single layered disc. I saw no noise or artefacts and the contrast is very low generally so no blown out highlights, but the image is rather flat. In full HD this would probably be brighter. Obviously, being a recent production there are no signs of damge or imperfections. A robust, modern stereo track with more active surrounds that most modern television. The score is usually channeled to the rears and dialogue comes through nice and clear. Obviously, this would have greater range and depth in lossless DTS-HD Master Audio. LFE is somewhat disappointing although the woofer was occasionally engaged; at it's best in scenes where bombs go off but a 5.1 boost would've been preferable. Subtitles are clear and easy to follow. A decent, if basic standard definition edition of this excellent 8-part series spread over three discs (two dual layered, one single). Image is as good as it can be given the format but due to stylistic choices is rather flat. Sound is decent if basic but active; but a 5.1 boost would've been preferable. Sadly there are no extras; the Norwegian release didn't have much of worth on it but it did have some EPK puff pieces and there are fans out there who like them, so a shame.